YUM! We've tried several versions of fajitas and this is one of the best, if not THE best. I found this recipe over at Our Krazy Kitchen and knew I wanted to try it because the chicken is marinated in beer. I chose to use Dos Equis since it went with the Mexican theme dinner. The fajitas turned out great! I marinated the chicken overnight (because it is easier to do it at night than before work in the morning). 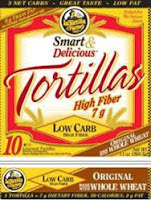 I served the fajitas with some great (and healthy) tortillas - La Tortilla Factory Smart and Delicious Tortillas. The tortillas only had 50 calories, 5 grams of protein and 7 grams of fiber! You can't beat that and they tasted great!! Everything you need to enjoy a guilt-free Mexican night! Mix all of the ingredients (except chicken) for your marinade. Marinate the chicken in a gallon zip bag for 4 - 6 hours. Grill over a 350f fire, flipping every 5 minutes until the breast hit an internal temp of 160f. For me, this takes right at 20 minutes. Those look moist and delicious. We have company coming on Saturday and this might be just the ticket! Chicken looks delicious - fajita's are a favorite around here. Those sound frigging awesome, I totally have to try them out. Heh, I'm a sucker for a beer marinade too. Wow, these sound delicious! I love stuff marinated with lime juice! I loved those when I first made them. Simple but flavor rich! Yours look perfect, Steph.